Blood pressure medication Lopressor (metoprolol) is a beta blocker used to treat high blood pressure and angina pectoris (chest pain). 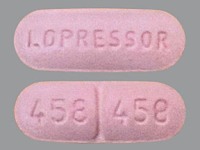 Lopressor (metoprolol) is also used after a heart attack. Lopressor (metoprolol) may also be used to treat other conditions as determined by your doctor. Lopressor side effects, that may go away during Lopressor blood pressure medication treatment, include mild drowsiness; lightheadedness or dizziness; or unusual tiredness or weakness. If Lopressor side effects continue or are bothersome, check with your doctor. CHECK WITH YOUR DOCTOR AS SOON AS POSSIBLE if you experience Lopressor side effects like difficulty in breathing. If you notice other Lopressor side effects not listed above, contact your doctor, nurse, or pharmacist.